Keerthinidhi Kesarisingha - Kannada Historical Fiction penned by Chitra Amma! So mum (Chitra Amma aka Chitra Ramachandran) is a BIG history buff! She and my aunt (Vidya Murali) are particularly fascinated with history of Mysore and surrounds. Their book Keerthinidhi Kesarisingha is an enthralling historical tale of courage and valour, based in Tippu Sultan's times! After many years this pet project saw light of day as a blog, and now its finally got published! Its a rich book with colourful illustrations by my aunt. Most friends and acquaintances reading the book, say that its like watching a movie! Now that its published, we are amateurs in the publishing world and figuring out how to reach it to the audience!!! 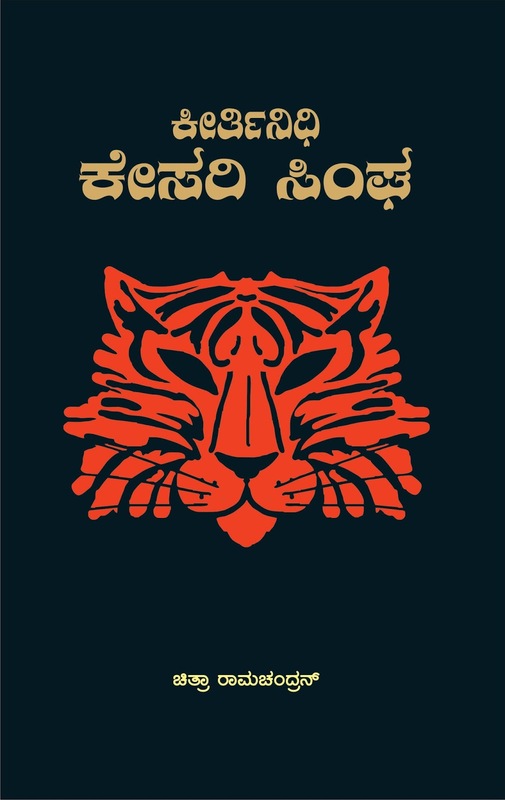 If you read Kannada and love books - this one is for you! 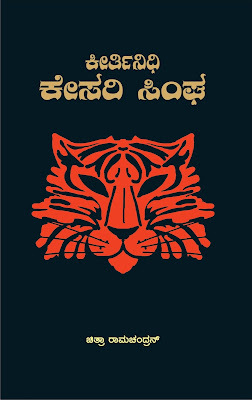 Its a wonderful book for children (12 years and up), youth and anybody with an interest in Kannada literature! Facebook Page: This page keeps getting updated with very interestinghistorical trivia, and sample illustrations! Also check out the home-made video preview for this book below or here in Facebook. If you are in India, the easiest would be to contact us via mail on kesarisingha@gmail.com. The book costs Rs.250/- and there will be a small postage charge depending on where in India you are. Just use the 'Buy Now' button on the side panel of this blog! The cost covers shipping anywhere in the world. 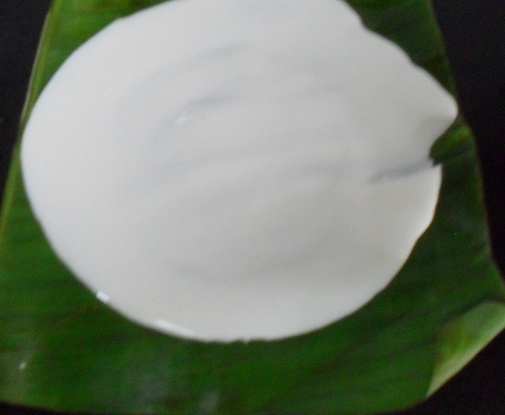 If you are interested in BULK PURCHASE (give them as gifts for a wonderful way of celebrating Kannada! ), send us an email (kesarisingha@gmail.com) and we'll let you know the discount as well as shipping charge! Do share this link with your Kannada friends! Modakam, kadubu, kudumulu, sweet momos, pithe and kozhukattais are all sweet delicacies prepared using rice flour, jaggery and coconut. 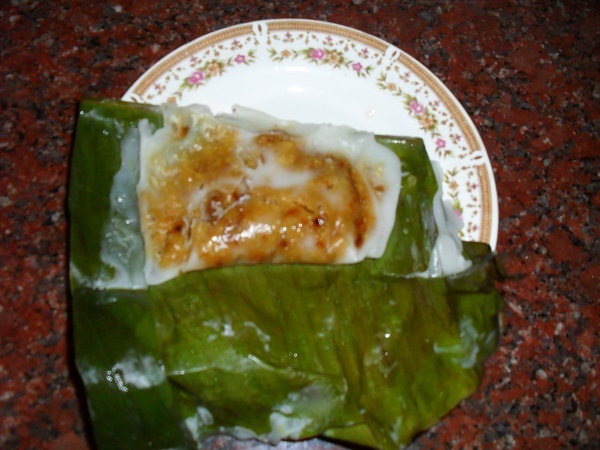 Elai Adai or leaf pancake which comes from God's Own Country (Kerala) is a variation of the ambrosial kozhukattai offered to Lord Ganesha. This delicious sweet is prepared using the same heavenly combination of ingredients and cooked in a banana leaf (elai) parcel. 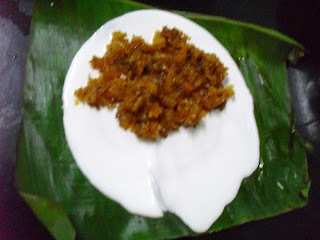 "Kozhukattai by any other name would taste as delicious" indeed! 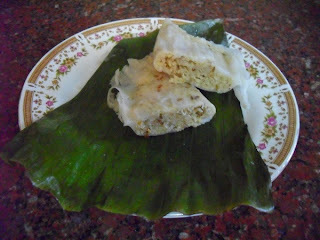 Here is how I prepared the sweet as well as the savoury versions of Elai Adai. 1. 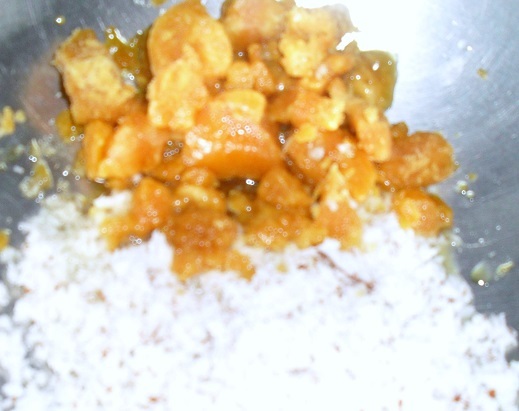 Add a spoon of water to the crushed jaggery and coconut, and cook on low flame. 2. 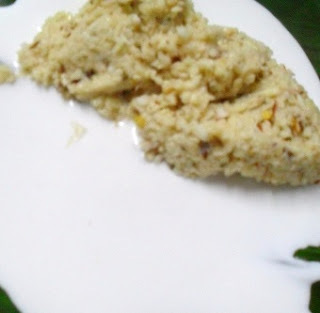 Keep stirring until the filling (pooranam/Hoorana) comes together. 3. Mix in cardamom powder and keep aside. 1. Soak black gram dal and red chilly together for half an hour and drain. 2. Add salt, coconut gratings and asafoetida to the dal and grind them together into a coarse mixture without adding water. 3. Mix in the cumin seeds and keep aside. 1. Soak the rice for three hours. 2. 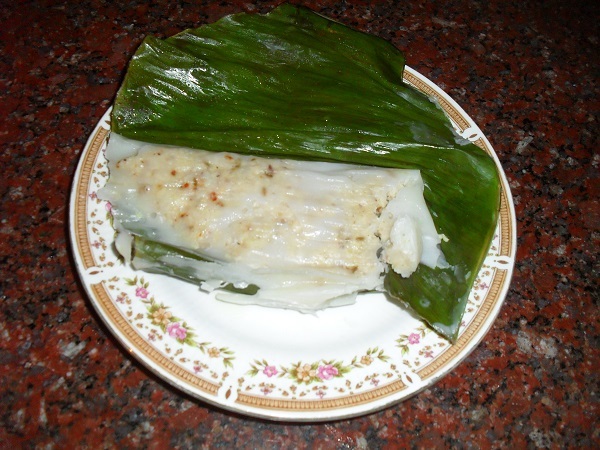 Drain the soaked rice and grind it with salt into a smooth and thick paste. Add only the required quantity of water little at a time. The batter should be thick enough, so that it does not run out of the banana leaf while spreading. 1. Slit a broad banana leaf in the middle along the central vein. 2. Cut both the parts into pieces large enough to be folded into parcels. 3. 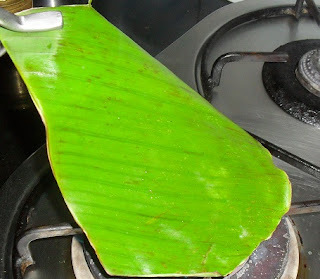 Wipe the pieces of leaves and flip them one by one over the flame (like you roast a papad) so that they become pliable. 1. Grease the banana leaf and pour a ladle of batter in the center. 2. 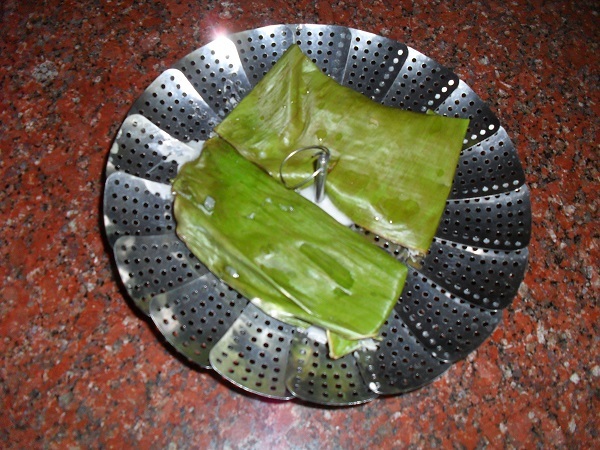 Spread the batter into a round adai using the bottom of the ladle. 3. Take a tablespoon of the filling and place on one side of the batter circle. 4. Gently fold the leaf in the middle over the adai, and fold the edges together like when you would fold a cloth to hem. 5. Fold back the other two open sides over the parcel. 6. Gently lift up the parcel using both hands and place it on the perforated steamer, with the folded sides facing down. 7. 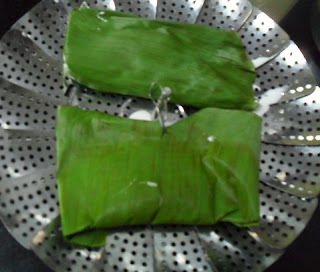 Make more adai parcels using the sweet and savoury filling and arrange them on the steamer. 8. Place the steamer inside the cooker and steam for 15 minutes without the weight. 9. Allow to cool and remove the now firm parcels. 10. Open the parcels and peel out the elai adais from the leaf. Enjoy the sweet version of the elai adais while they are still warm. Relish the savoury version with any chutney of your choice.